I truly intended to do a newsletter monthly, but life has been incredibly busy and fulfilling with very little time to sit and catch up. Seasonal may have to do for now! I have an awesome series for all you hard-working people! This is a fun, easy-going, basics series with the busy human in mind. It's also easy on your budget. These are focused, packed with information and demonstration so you can get the most in a short time. It's one hour with no rush, no fuss! The focus is on learning and fun. Every class is a wonderful stand-alone but is laid out in a manner to build upon the previous class if attendees wish to layer their learning. Because the classes are wrapped all around the holidays, it's a great chance to come play, shop, and learn all at once! Note; all classes are individually listed in events on the Faces by Ren Facebook business page. November 6th; The foundation before foundation; Glowing skin and how to prep-your-face. Makeup only goes on as well as you've prepped. Do you really need that expensive primer? What steps are important and what can we let go? Reveal it or cover it? Let's talk about the most important foundation of makeup...your SKIN. November 13th; Build a solid foundation; What is the difference between concealer and foundation? Is flawless the goal or full coverage? These mysteries and more will be covered (get it?) in this fun and informational class. More is not always better unless we are talking chocolate. So let's explore what flawless means to you and how to achieve a clean, smooth face that is ready to face the challenges of the day. November 20th; Highlight/contour for the non-Instagram celebrity. I know, I know...we've all seen the videos where they contour and highlight as if they're getting ready for a theater production. That's all good and fun, but you don't have time for that nonsense. How about some subtle, every-day techniques that anyone can add to their routine in minutes? It's fun and you'll knew where the glow goes. November 27th; It's not-so-basic; Basic eyeshadow techniques and how to adjust your routine to your lifestyle. Looking your best has never been more straightforward. A few brushes and a bit of information can take the intimidation of eyeshadow away. It's easy-peasy. December 4th; Eyeliner techniques; There are pencils, gel, liquid, and there are even eyeshadows for this as well! Let's look at a variety of ways to line the eyes including the tricksy ways that don't look like eyeliner. A different technique for different personal styles, moods, or events. December 11th; Beat your brow; You know you want to beat them some days! I don't mean bold, I mean brows have a mind of their own right? How can the average fabulous human get some control and fill without looking like they belong to someone else? Again, it's all about personal style and most people just want to tame those bad boys. Simple, clean techniques and products that will have you smiling about how cooperative your brows are behaving. December 18th; False lash application; The beasty of all beasties! We love them and we hate them. False lashes are one of the most glamorous effects for photo shoots and special events but most people struggle with application on their own eyes. This is one thing you will want to practice regularly, but I'm here to start you out on the right lash. ;) With proper information and practice, you'll have those fabulous lashes you need for just the right occasion. I highly recommend taking this class with a friend so you can help each other later! The Serenity Project in NYC! On October 21st we were in NYC for the Opening reception of the Serenity Project. All 16 participants had their selected underwater bodypainting printed on glass and hung for one night only at Venue57. It was a beautiful night from so many vantage points. Seeing 10 of the 16 participants and their reaction to both the calendar and the art was magic. Being in uptown NYC with a 9th floor view wasn't so bad either. Metavivor president and MBC patient Beth Fairchild put the entire event together with a posse of volunteers who poured their heart and soul into this. You can keep up with the project, watch the interview videos, and see new images as they are launched each month over at the MBC Info. Center website. All funds raised through the project benefit Metavivor Research and Support. You can purchase a calendar featuring an underwater photograph of each participant, and all 35.00 will go directly to metastatic research. Check out the calendars in the Metavivor shop. In Mid-October we were once again in Greensboro NC for the most prestigious bodypainting championship in all of North America. I was fortunate to have Tiffany Beckler as my assistant this year, and in spite of not being well prepared, we managed a 5th place in the pro category! The overall theme was "Heal the Body, Heal the World". Tiffany suggested that we paint the Serenity Project on our model and once it was suggested, I couldn't let that idea go. It was brilliant! We painted some of the underwater images on the model, and in homage to the two women who died from MBC for both Keith and myself, we painted portraits of them as well. My Mum (Cheryl Bidwell) and Keith's former wife (Serenity Dixon, for whom the project is named) both died from MBC and are the reason we have such a deep connection to this work. Competition is mostly about connecting with my big, messy, beautiful bodypainting family. It's always humbling to be there and to have such opportunities nearby. Once again, model Brittney Isphording wore the art like a true champion and some of the flowers which were part of the design, were in honor of her Grandmother who is a breast cancer survivor. Just a quick reminder that the travel sets are available this time of year and I'll be placing orders as interest dictates. Please be sure to contact me right away if you'd like to reserve a set before holiday season gets crazy. 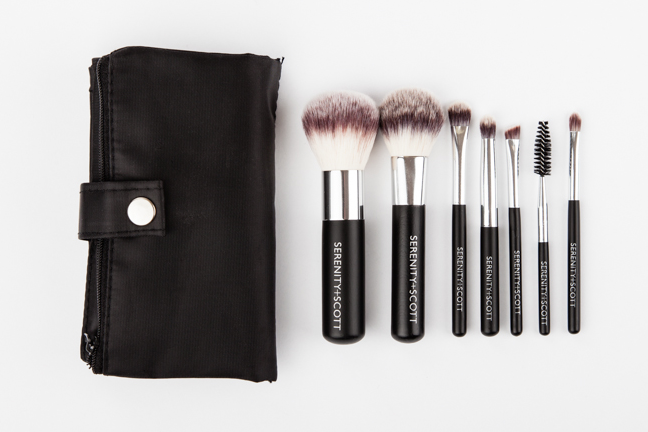 These are professional level brushes that are in a compact, easy-to-carry size. Just as soft and durable as the full size Serenity + Scott brushes. 60.00 per set, including travel bag. Hand crafted. Small batch. Sustainably sourced and preservative free. Last, but certainly not least is one of my favorite gift ideas; the Serenity + Scott eyeshadow palettes. Nine richly pigmented eyeshadows nestled in a custom palette. I especially enjoy building color sets for people using a bit of information about the preferences of the person receiving them. From natural to bold, let me customize a palette for you! Paraben, gluten, cruelty free beauty for 80.00 per 9-shadow palette. Custom 3-shadow palettes are 30.00 and all are re-fillable for 8.00 per eyeshadow. Explore downtown. Create memories. Stay out late. Downtown is always a great time on First Fridays! November 3rd will include a block party over by the new Blowtique store. Chili cook-off at 6:30pm on Main Street with a DJ, classic car show, and 5.00 unlimited tastings! Faces by Ren will be open from 6-9pm with hot drinks and hugs for anyone willing to get out on a fall evening. December First Friday is a full blow out party here! See below for details. Keep up with all downtown JC First Friday events on their Facebook page. Downtown Johnson City is the place to be for local, personal, and unique shopping experiences! We are celebrating Small Business Saturday with the rest of our downtown merchants. Stop by for a hot drink, personalized shopping, and even eye touch-ups for 25.00. I'll be gift wrapping any purchases made that day as well! Enjoy the less stressful environment that local businesses offer. Local food, local gifts, and local atmosphere all within walking distance. Oh, and did I mention chocolate? Oops...silly me. The BEST part about Small Business Saturday is that several merchants will have chocolate on hand that day. You could do a whole chocolate stroll. December 1st; Studio celebration for 6-year anniversary and Wizard Cat Merlin calendar launch party! Yes, it's been six years since Keith Dixon Studios and Faces by Ren officially opened a brick and mortar space in the Tri-cities. Those six years have been filled with grand adventures, growth, and challenges. To show our gratitude, we are celebrating! Both studios will be open from 12pm-9pm on Friday December 1st; Open House at both 310 and 308 South Roan in Johnson City. Drinks and refreshments, our latest art collaborations on display including images from the Serenity Project, Merlin the wonder-wizard on site, Merlin calendar launch (be the first to get your limited edition handmade caldendar for 2017! ), product demonstrations, live bodypainting demonstration from 3-6pm, model on site from 6-8pm down at Tipton Art Gallery for the "Warhol, Body Art, and Yoga" art show, as well as studio door prizes! We can't wait to see you. Deep gratitude for being along for the journey whether you're new to our services or you've watched the whole crazy thing unfold. We appreciate each of you beautiful humans so much.